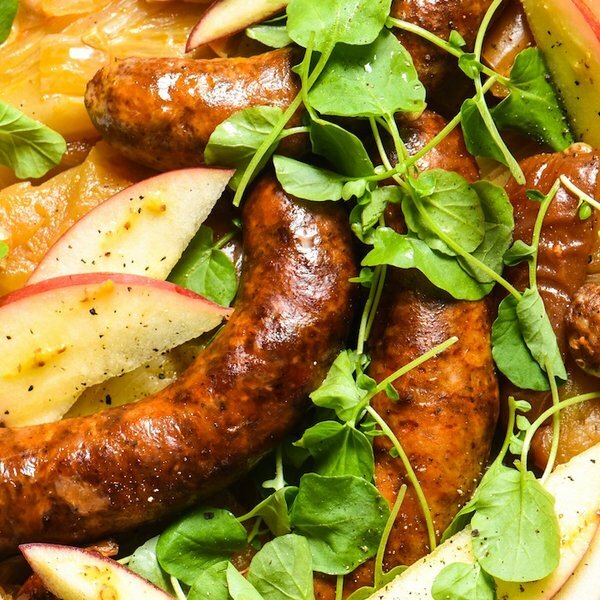 Pommies Sausage & Apple Recipe » Pommies Cider Co.
Our easy-to-make Pommies Seared Sausage & Apple Recipe is perfect for fall. Try it today! 1. Heat oil in a large skillet over medium-high heat. Add sausage and cook until golden brown (7 minutes). Place on plate to the side. 2. Add sliced apples to skillet. Add onion and cabbage, and mixed around the apples. Season with salt and pepper. Cook until apples are golden brown, stirring occasionally (4 minutes). 3. Add sausage back into the skillet. Add cider and apple cider vinegar. Mix and let simmer, occasionally turning the sausages until cooked, and apples are soft (20 minutes).